The Lynn School Committee is made up of dedicated and experienced citizens of Lynn who are committed to working with the school administration toward maintaining a quality educational environment and to support the continued growth of all of the students of the Lynn Public Schools. The Lynn Public School System is committed to providing all of our students in all our schools an equitable opportunity for optimal achievement in all academic areas. Please feel free to contact us with your questions, comments or concerns. Address your correspondence using the contact information provided below. For information and resources, please select an item from the left hand menu to view information and download links to available files and forms. - We will make all students our priority. - We believe students are best served by supporting the needs of families, staff and all stakeholders. - We will set goals and define accountability for the Committee, Superintendent, staff and students. - Maintain transparency, trust and mutual respect between and among Committee members, the Superintendent, and the administration by treating everyone with dignity and respect, even in times of disagreement. - Base decisions on our stated goals, vote our convictions, avoid bias, and uphold and support the decisions of the majority of the Committee once a decision is made. - Recognize that authority rests only with majority decisions of the committee and make no independent commitments or take any independent actions that may compromise the committee as a whole. - Agree that our positions will not be used for personal or partisan gain. - Acknowledge that a Committee meeting is a business meeting held in public – not a public meeting. We will make every effort to ensure that meetings are effective and efficient. - Respect the leadership roles of the Committee Chair and Superintendent. - Set the tone for the entire system and make every effort to promote a positive image for our school system. - Have a clear understanding of the roles and responsibilities of the School Committee and the Superintendent. - Channel requests for information, reports, and data through the Secretary, the Superintendent, and/or the Chair rather than directly to staff. The Superintendent will ensure that each member has equal access to this information in a timely manner. - Recognize the importance of proactive communication and agree that there will be no surprises. 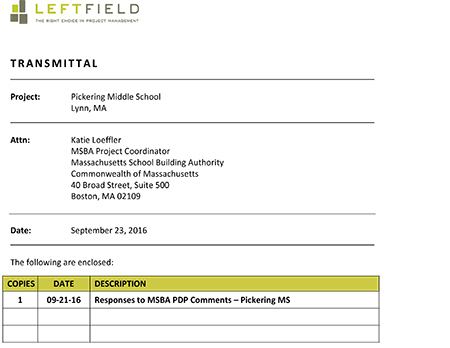 If Committee members have questions or concerns, they agree to contact the Superintendent well in advance of a meeting. - Maintain the confidentiality of privileged information and respect Open Meeting Law. - Refer constituent concerns and complaints to the appropriate person within the district chain of communication. 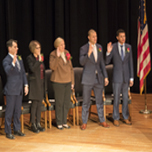 - Recognize the importance of working collaboratively with city officials to improve our schools and actively seek ways to enlist their support for our efforts. - Recognize the importance of honoring our norms and beliefs and agree to take responsibility for respectfully reminding one another when we get off track. Beginning in September the Committee meets on its regular schedule. There are no regularly scheduled meetings in July and August. You may also visit the City's Online Calendar for posted meetings and updates. Click the icon for live streaming when a scheduled meeting is being broadcast. School Comittee meetings are now available for live viewing with your web browser. Please note: Your web browser must support Flash content and be configured correctly in order to watch the streaming broadcast. The free to download "Puffin" browser has been tested and works successfully with Mac, Windows and Android devces. Visit the "Puffin" browser website for more info and downloads. Previous School Committee meeting agenda, meeting mintues are listed and linked below. 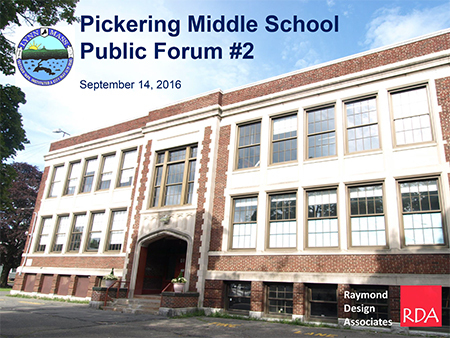 Video (when available) of meetings prior to June 2, 2016 must be requested by email to the webmaster. Please note there is no video available for the 2011 meetings. 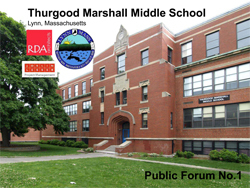 Thurgood Marshall Ribbon Cutting Ceremony Video! How do I apply for free or reduced lunches? Lynn Public Schools is participating in a Free Breakfast and Lunch program for the current school year (2018-19). This alternative is referred to as the Community Eligibility Provision. All students enrolled in Lynn Public Schools may participate in the School Breakfast Program and the National School Lunch Program at no charge. Household applications are not required to receive free meals. How do I apply to substitute teach? You must go the the School Department Personnel Office located on the fourth floor of the School Administration Building and apply. How do I apply for a teaching job in the Lynn Public Schools? You must go the the School Department Personnel Office located on the fourth floor of the School Administration Building and apply. How do I apply for a lunch aide job at a local school? You must apply at the School Department Personnel Office located on the fourth floor of the School Administration Building.